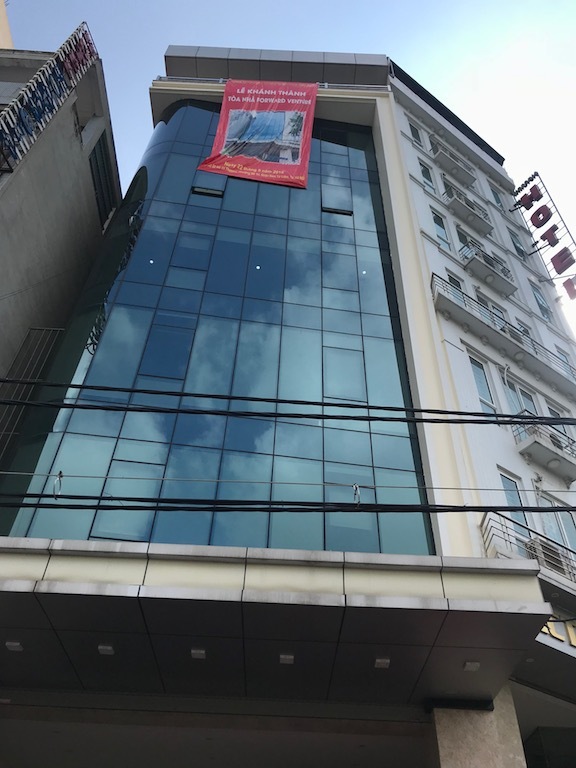 The community center in Hanoi is called a miracle of God. 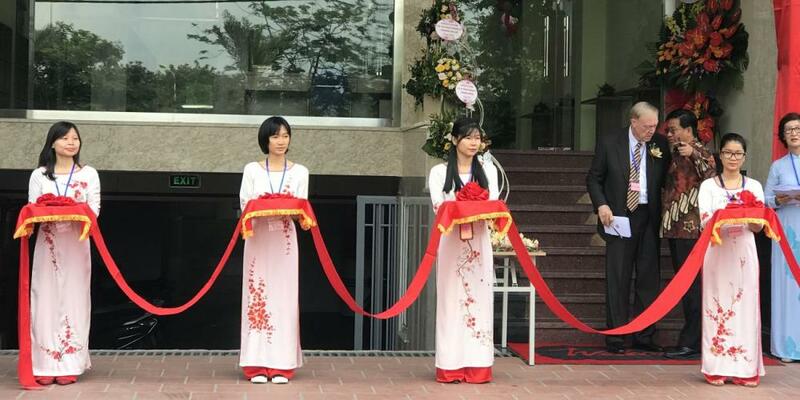 Bekker beamed with joy on May 22 as Adventist Church president Ted N.C. Wilson and other leaders inaugurated the seven-story building, which will house a bookstore, a health food store, a foreign-language school, a music school, a health center, ADRA’s Vietnam headquarters, and meeting halls for two congregations. 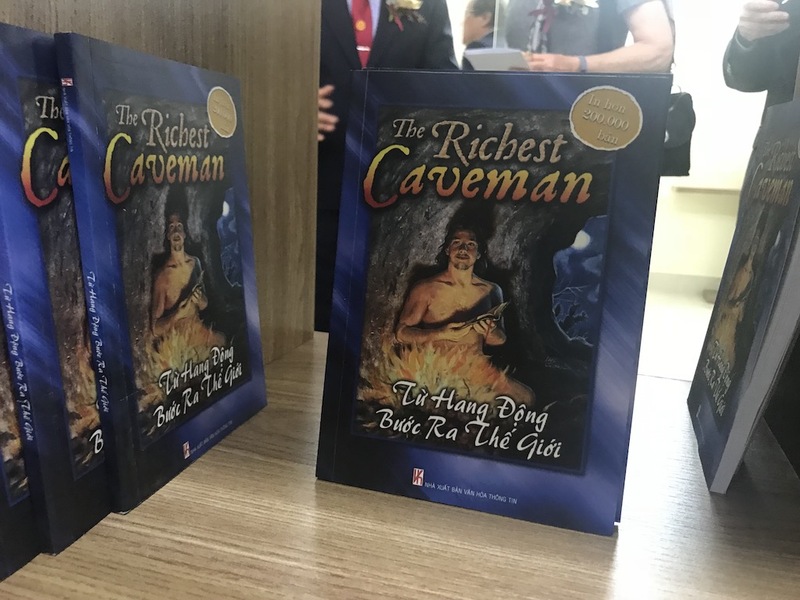 The origins of the project go back to 2014 when Wilson visited Hanoi in the north after leading a milestone evangelistic series in Ho Chi Minh City in the south. 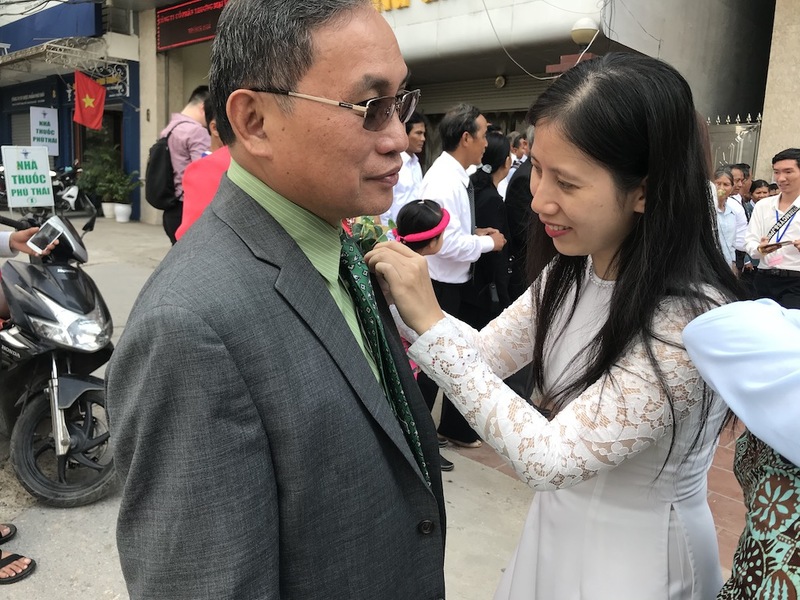 Wilson was the first non-indigenous person permitted to speak at an Adventist evangelism event in Vietnam since 1975, a major step for the church since the government granted permission for the denomination to resume operating here in 2008, ANN reported at the time. 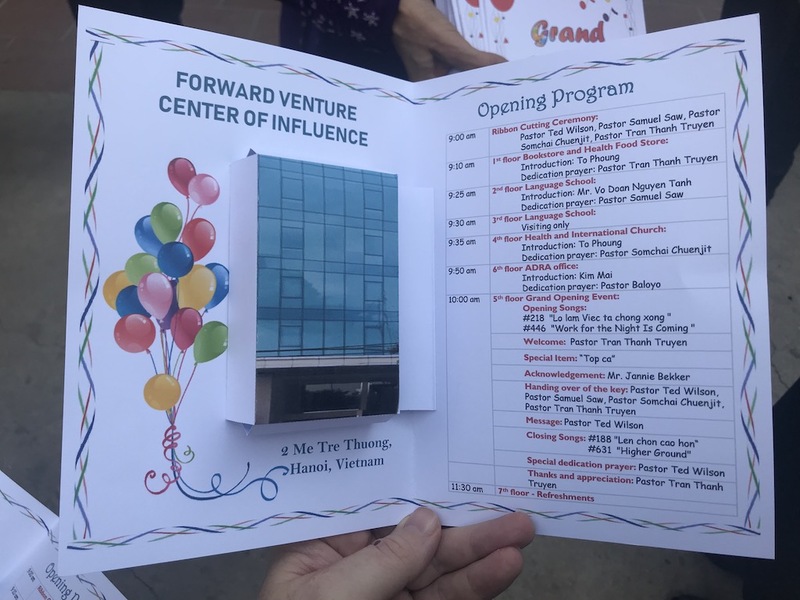 The inauguration program with a pop-out building inside representing the center of influence. 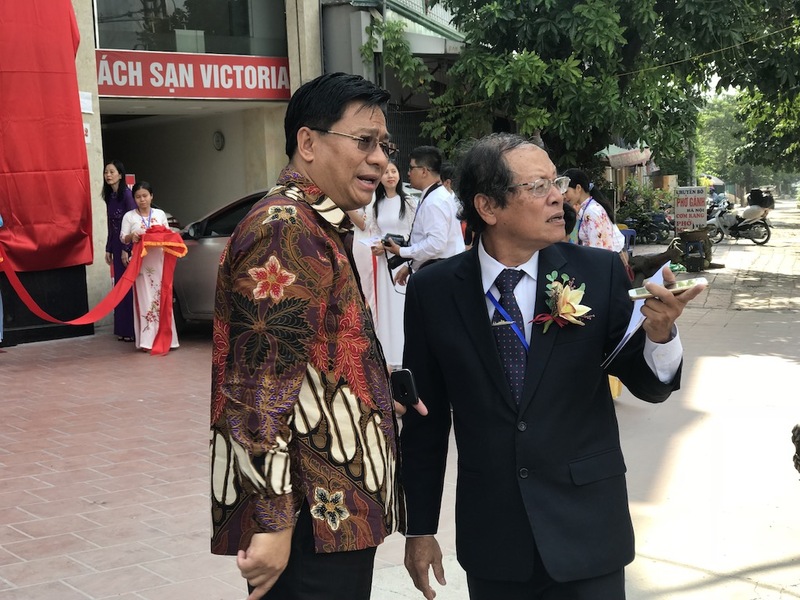 Samuel Saw, left, president of the Southern Asia-Pacific Division, speaking with Tran Thanh Truyen, president of the Vietnam Mission. Ted N.C. Wilson, president of the Adventist world church, greeting a girl as his wife, Nancy, looks on. Max Langi, treasurer of the Southern Asia-Pacific Division, receiving a boutonnière. 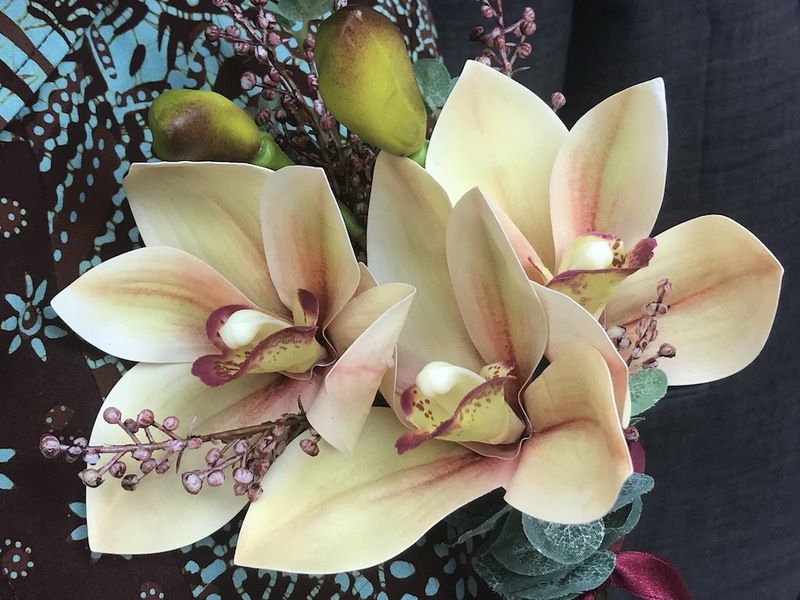 The corsages pinned on women were more elaborate than the men's boutonnières. 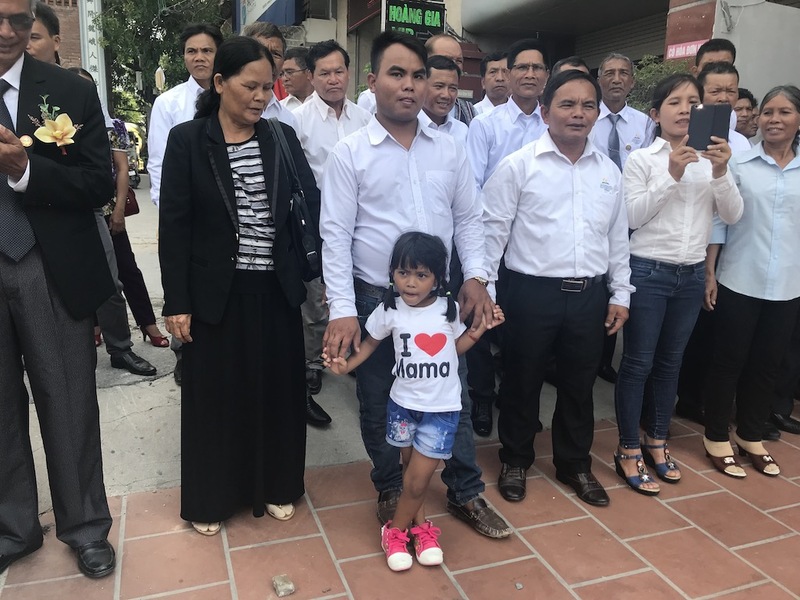 Some of the 40 farmers who rented a bus in southern Vietnam and traveled nonstop 625 miles (1,000 kilometers) in two days to Hanoi. 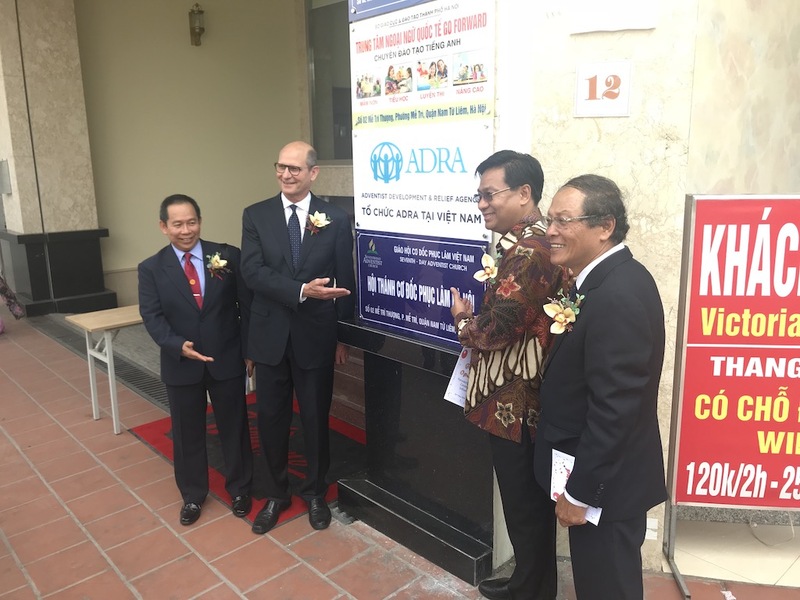 Adventist Church president Ted N.C. Wilson, second left, cutting the red ribbon with Somchai Chuenjit, left, president of the Southeast Asia Union Mission, and other leaders. 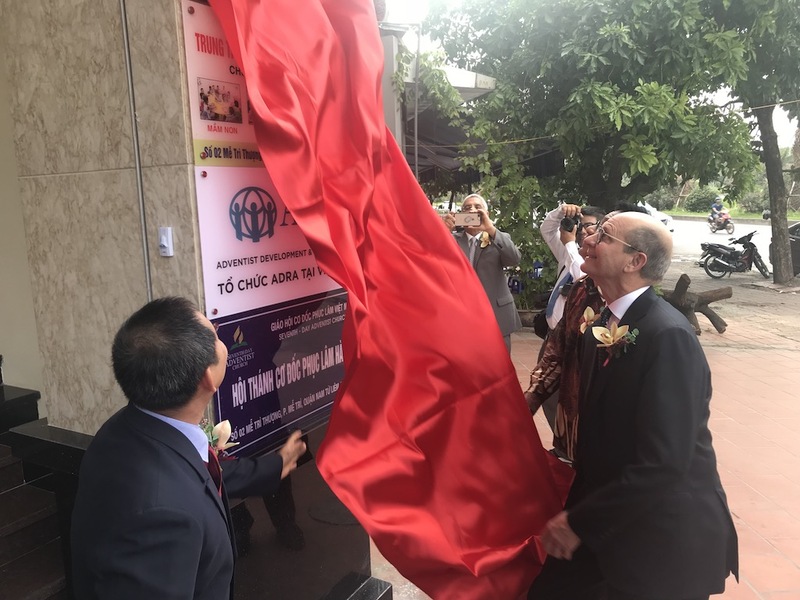 Adventist Church president Ted N.C. Wilson unveiling the sign outside the community center in Hanoi, Vietnam. Church leaders posing outside the community center in Hanoi, Vietnam. 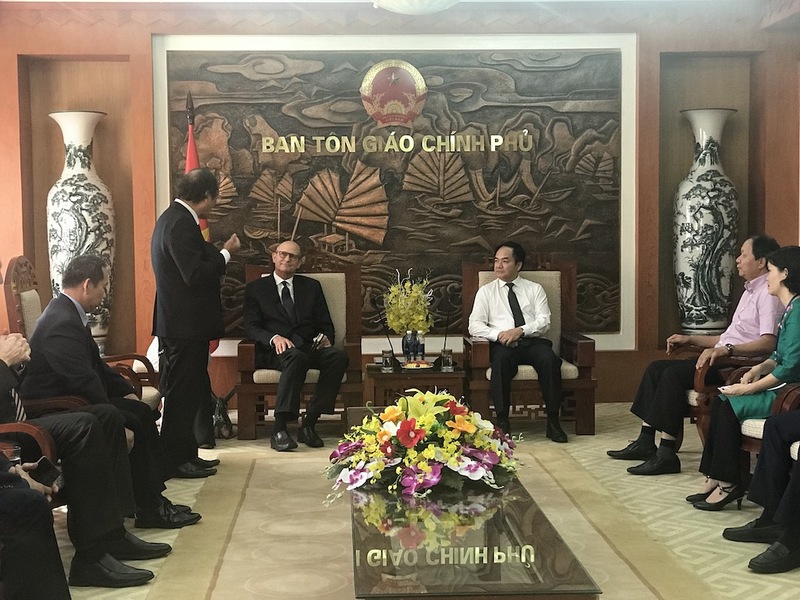 From left: Somchai Chuenjit, president of the Southeast Asia Union Mission; Ted N.C. Wilson, president of the Adventist world church; Samuel Saw, president of the Southern Asia-Pacific Division; and Tran Thanh Truyen, president of the Vietnam Mission. 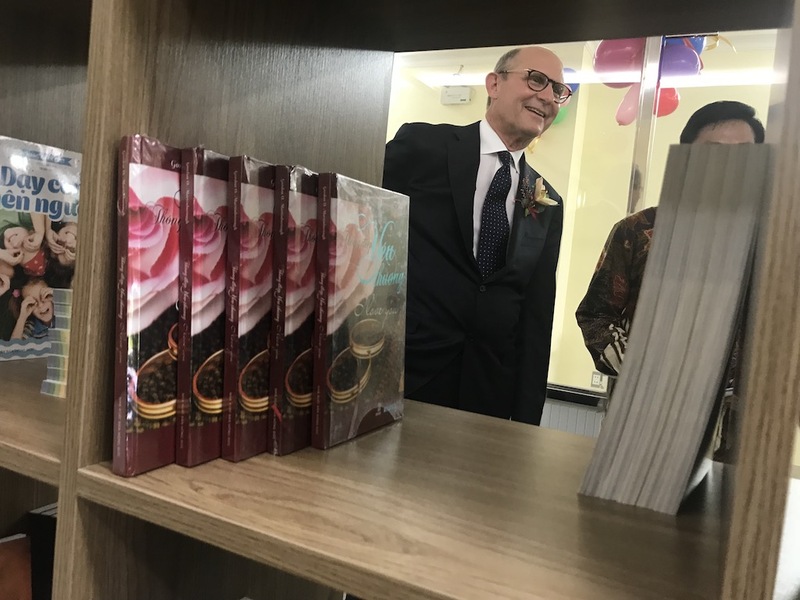 Adventist Church president Ted N.C. Wilson visiting the bookstore in the community center. 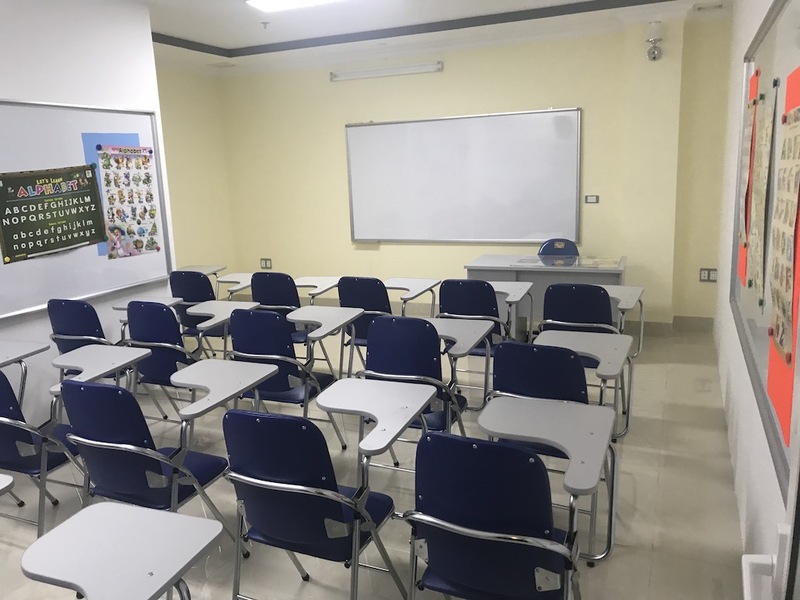 A classroom in the foreign-language school on the second and third floors of the community center in Hanoi, Vietnam. 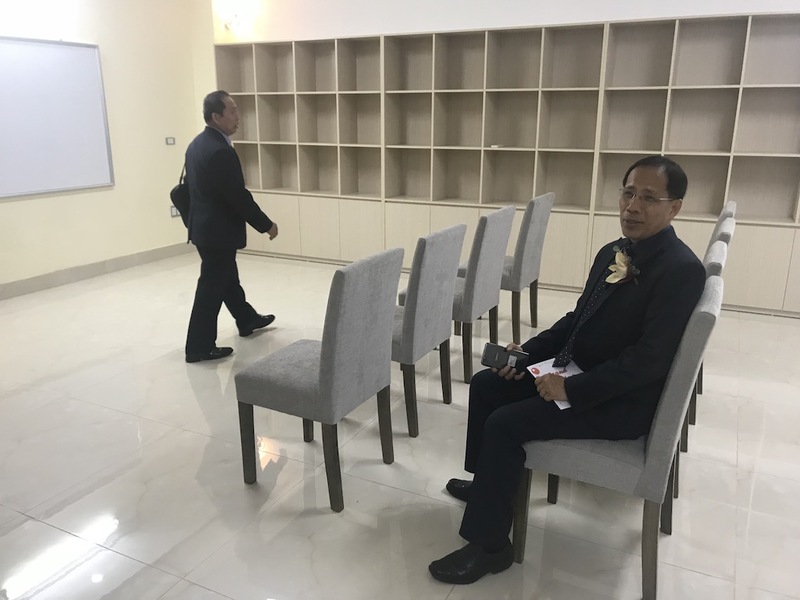 Rudy Baloyo, right, executive secretary of the Southern Asia-Pacific Division, sitting in a health seminar room at the community center in Hanoi, Vietnam. At the left is Somchai Chuenjit, president of the Southeast Asia Union Mission. The hall of the international church at the Forward Venture community center in Hanoi, Vietnam. 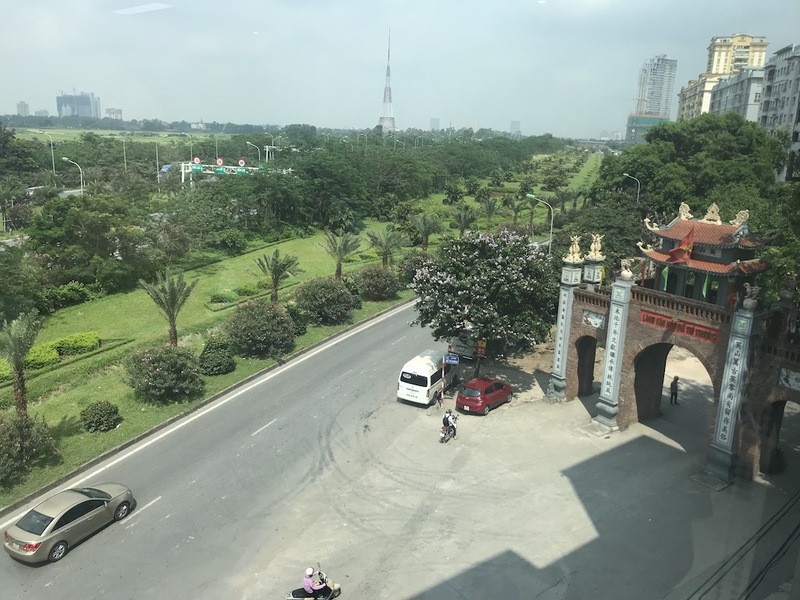 A view from the large windows of the international church at the Forward Venture community center in Hanoi, Vietnam. 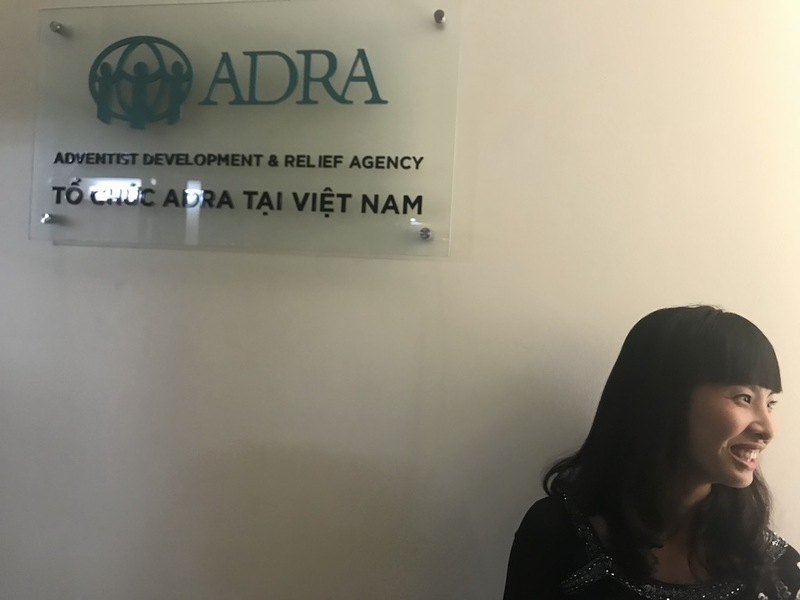 The sign for Vietnam headquarters of ADRA in the Forward Venture community center in Hanoi, Vietnam. 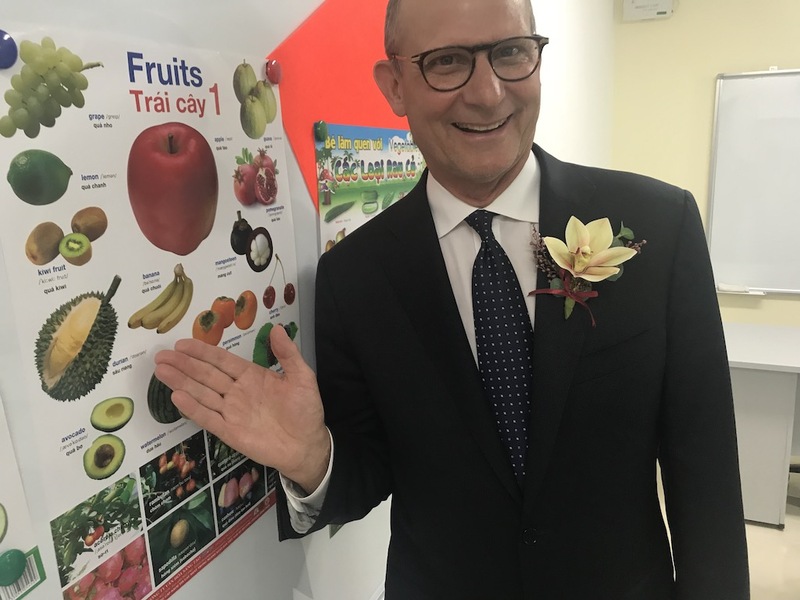 Ted N.C. Wilson, president of the Adventist world church, finding a picture of one of his favorite fruits, durian, in the language school at the Forward Venture community center in Hanoi, Vietnam. 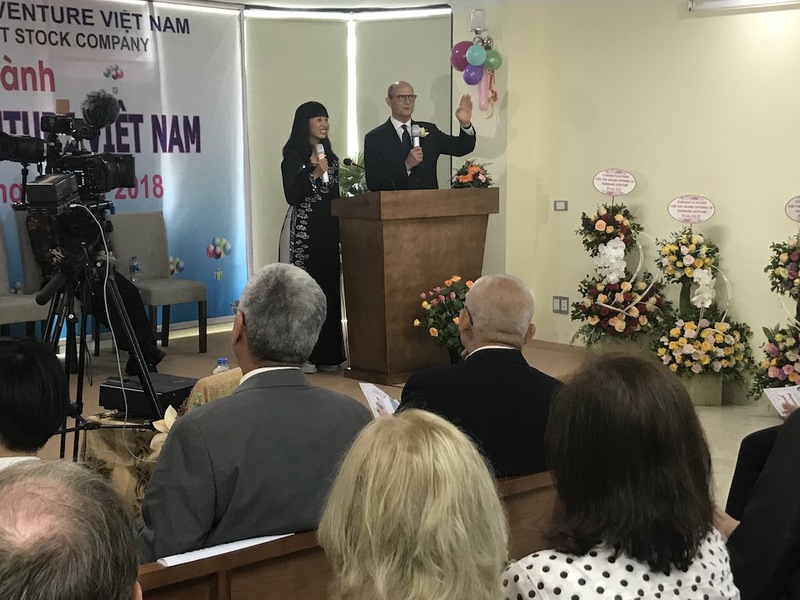 Ted N.C. Wilson, president of the Adventist world church, speaking during an inauguration ceremony at the Forward Venture community center in Hanoi, Vietnam. 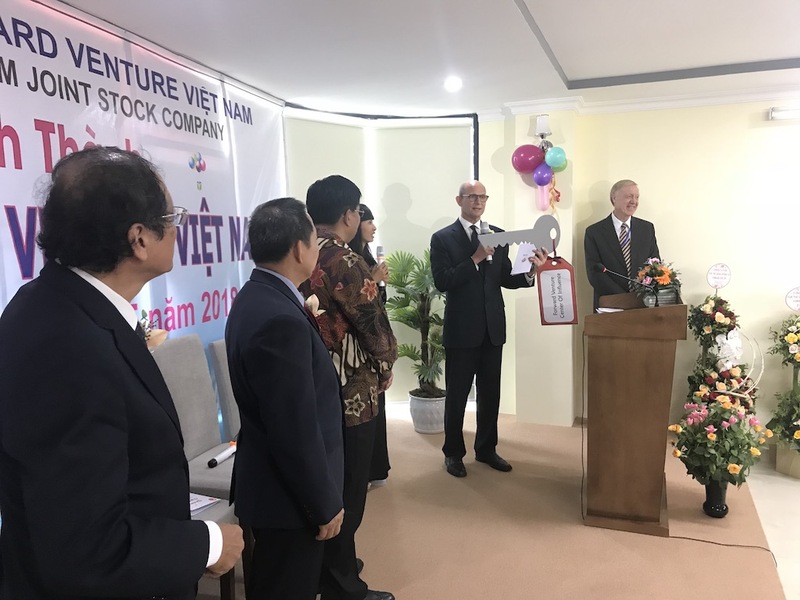 Attendees responding with laughter when Ted N.C. Wilson, president of the Adventist world church, spoke of finding a picture of durian in the language school at the Forward Venture community center in Hanoi, Vietnam. 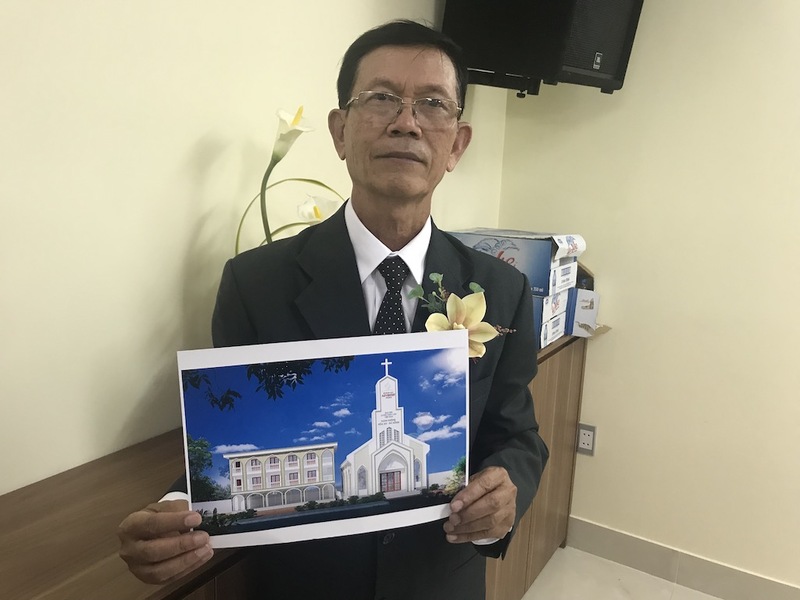 Vo Hiep, 74, a lay leader from Da Nang City who traveled 14 hours by train to attend the opening of the Forward Venture community center in Hanoi, Vietnam, showing a picture of the church and community center that he hopes will open in his hometown. 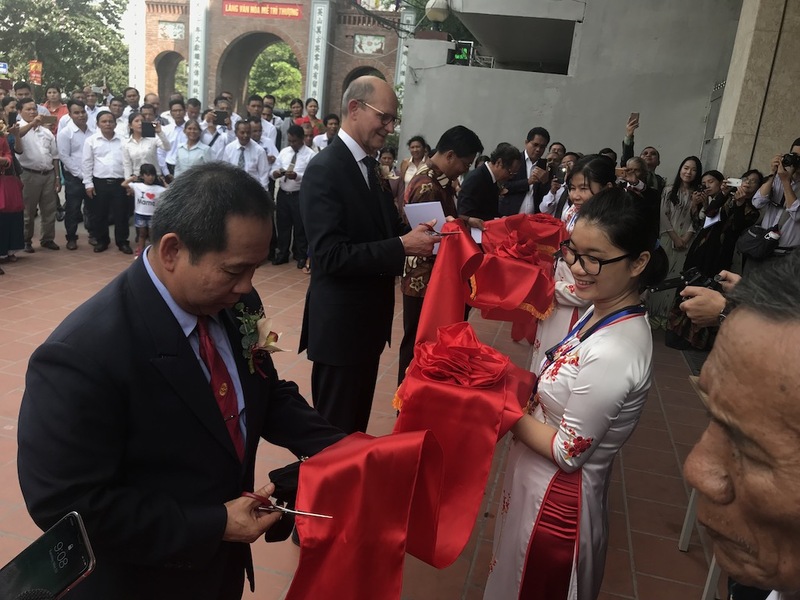 Ted N.C. Wilson, president of the Adventist world church, handing over a symbolic key at the inauguration ceremony of the Forward Venture community center in Hanoi, Vietnam. At the right is Jannie Bekker, who played a key role in the opening of the community center. 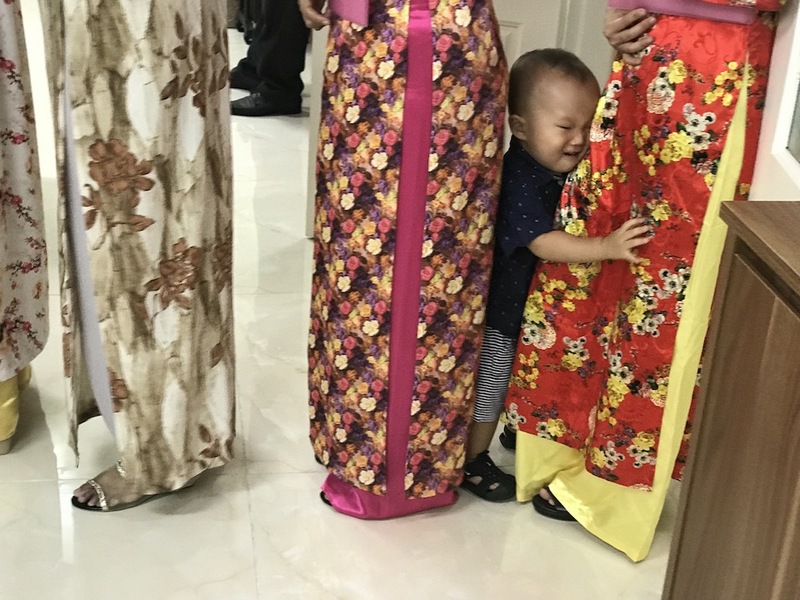 A boy clinging to his mother at the opening of the Forward Venture community center in Hanoi, Vietnam. His mother and other women, dressed in traditional attire, sang in a choir. 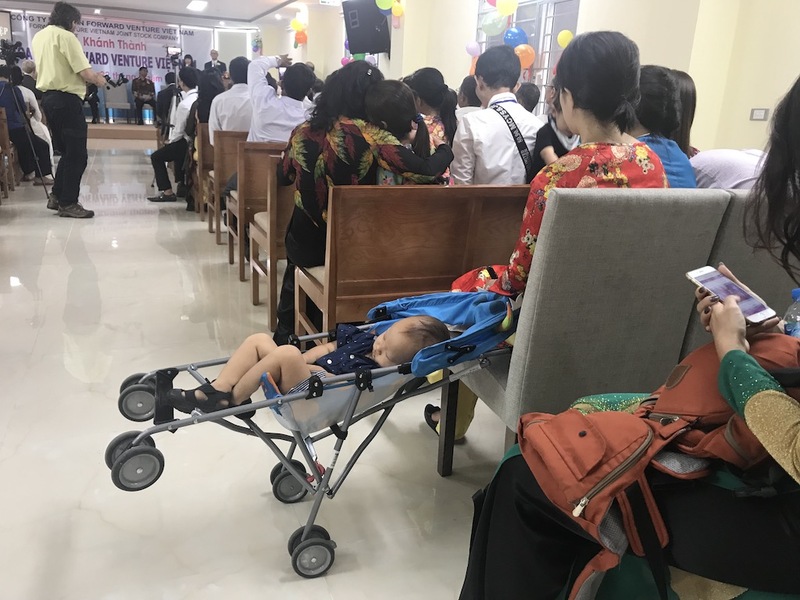 Moments later, the boy was sound asleep in his stroller as his mother listened to the inauguration ceremony at the Forward Venture community center in Hanoi, Vietnam. 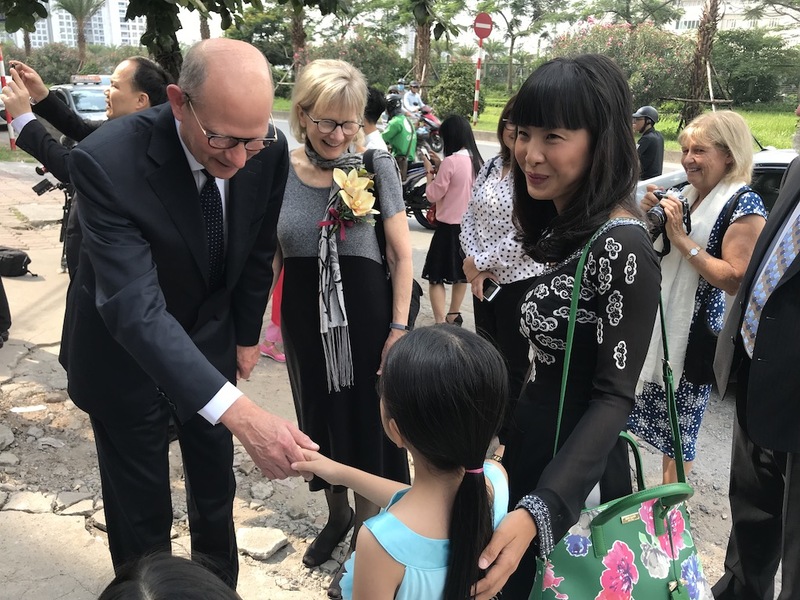 Ted N.C. Wilson, president of the Adventist world church, meeting in Hanoi with Ngo Sach Thuc, a senator and vice president of Vietnam Fatherland Front, which oversees religious organizations in Vietnam. 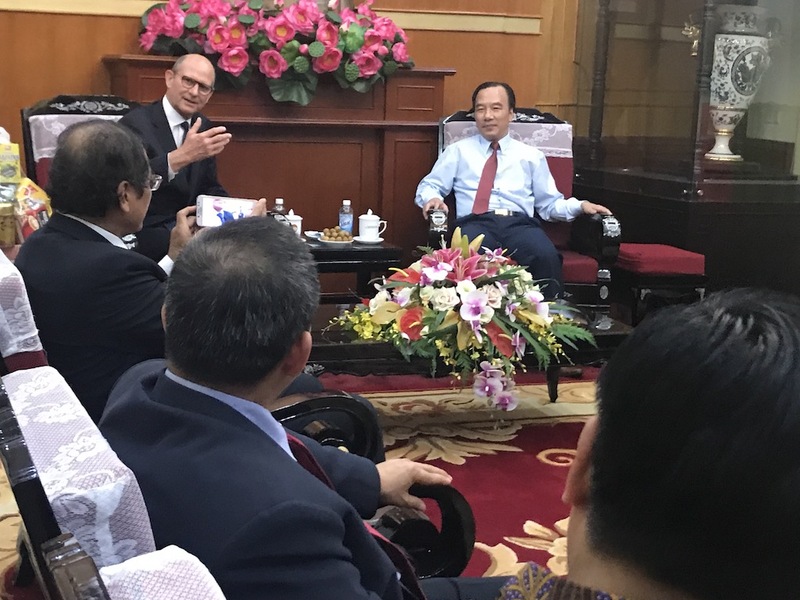 Ted N.C. Wilson, president of the Adventist world church, meeting in Hanoi with General Vu Chien Thang, chairman of Government Committee for Religious Affairs for Vietnam. During the inauguration, Adventist leaders toured the community center and prayed on each floor. 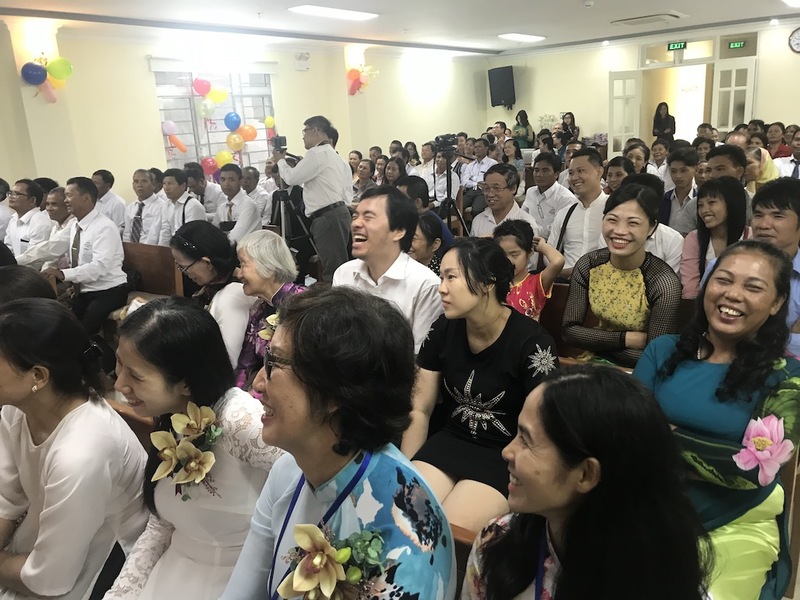 The church has 15 ordained pastors in Vietnam, and all were invited to the event. 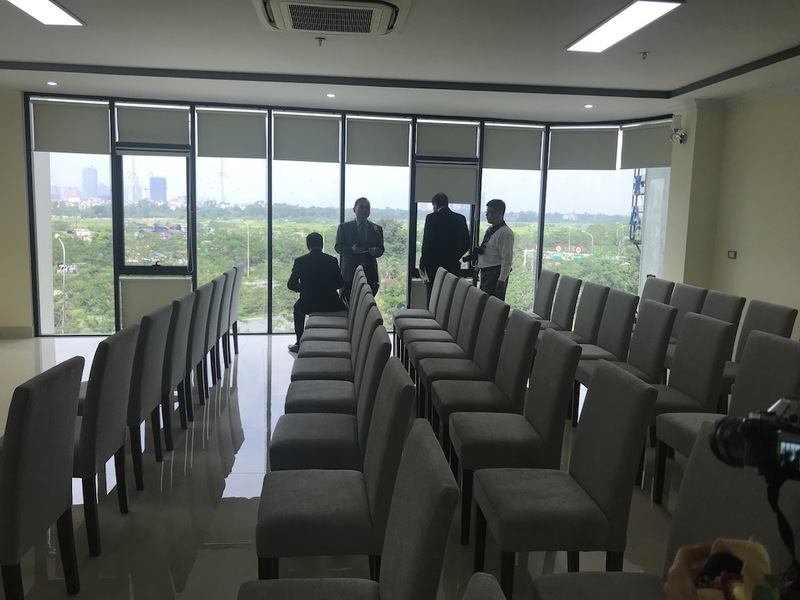 Also in attendance were 40 farmers — who rented a bus in southern Vietnam and traveled nonstop 625 miles (1,000 kilometers) in two days to Hanoi — and a few lay leaders like Vo Hiep, 74. ADRA New Zealand A Global Mission pioneer coaches volleyball, the director for ADRA in New Zealand, and Adventist volunteers working in Cyprus. May 26 - Punching Girl Flora had a really bad habit of punching other girls when she didn't get her way. Let's see how Jesus changed her heart.